Once again, Mario is called to the rescue, this time to save his brother Luigi from the claws of evil Bowser. 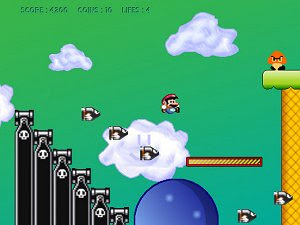 Explore over 25 levels and face 10 different enemies in this nice free Mario platformer using the keyboard or even a gamepad. Turn on the Blood Mode for extra fun, with the enemies now spilling their blood over the levels! A level editor is also included for extending the fun in Mega Mario!